Some people like to go on backpacking with a large group of close friends, some go as large families, whilst others just like to have a roomy den there in the wild. While four person tents have enough room for several people, the best six person tent will show you that it has enough to provide you with everything you need to accommodate your large group of outdoor enthusiasts. Or a plenty of other gear. Or both. Tents are normally made of very light materials, so the difference in weight between an average four person and an average six-person shelter is unnoticeable. Things go similar with the space these take in the backpack, so basically if all conditions regarding the backpack and the backpacker fitness to carry a four-person tent are met, there will be not much difference when you go with a six person shelter option. Here, we are going to show you the features you should know about when it comes to a six person tent. Also, you can peruse the reviews following that to see which tent will work for you on your next outing! There are smaller tents than six-person ones, and also there are bigger, way bigger ones. However, for backpacking, hiking, camping, mountain biking and other activities where you do not carry the shelter in a motor vehicle – at least not always – tents which have the capacity rating of six people are considered the largest. Most tents larger than that – those rated for 8, 10 or 12 persons, or even more, are primarily intended for some other activities. Despite the fact that there are not many technical differences between six-person and four person tents, some things need to be adjusted for the use of a larger group of persons. The fact that a tent is designed to take in six persons at a time, required effort of designers towards making more options for easy access and easy exiting out of it. Tents with two doors are more common in this category, and when there is still a single-door design, it is usually a large one which is intended to prevent so-called “log jams” when persons inside the tent are making it hardly possible to enter or disembark. The number of doors depends on a personal preference. Some parents will like to keep their eyes on their children with ease, and single door tents will make that task a bit easier. Some people allow more freedom, travel without children, or simply want an increased comfort, that’s why they choose two-door tents. Six person shelters provide more internal organization options, especially when the actual number of occupants is lower. The person capacity rating itself always pertains to sleepers in bags. However, the space provided by most six man tents is enough for two queen air beds – where one can have a home level quality of sleep. 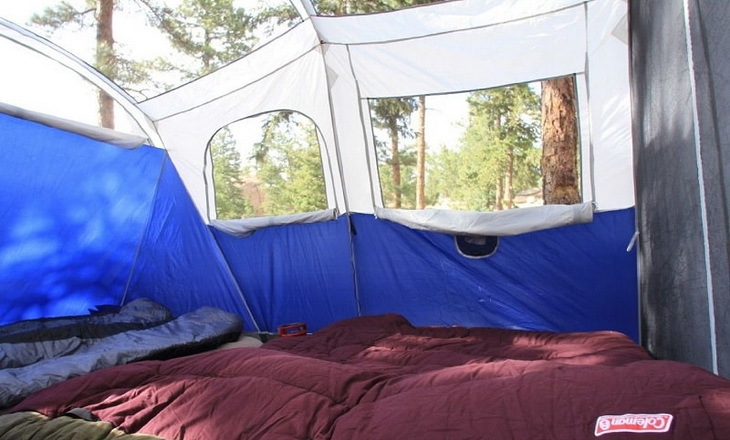 Depending on privacy needs, some tents may come with two rooms. In most, if not all cases, these rooms have both their separate doors and an internal passage connecting them. This design increases the number of possible sleeping combinations, depending on the size and structure of the group. A large portion of these tents in the market is made of lightweight artificial fabrics with alloy or fiberglass frames. This is done to maintain a good and bearable weight while carried. But still, many tents have steel frames or frame parts which add to its weight but significantly increase tent stability. There are still tents made of natural fabrics such as cotton. Despite being quite heavy, such tents still have their big fans, especially those who do not mind it, carry it on vehicles or horseback, or simply withstand the weight knowing they will get much greater comfort once they find a suitable place and deploy their tent. 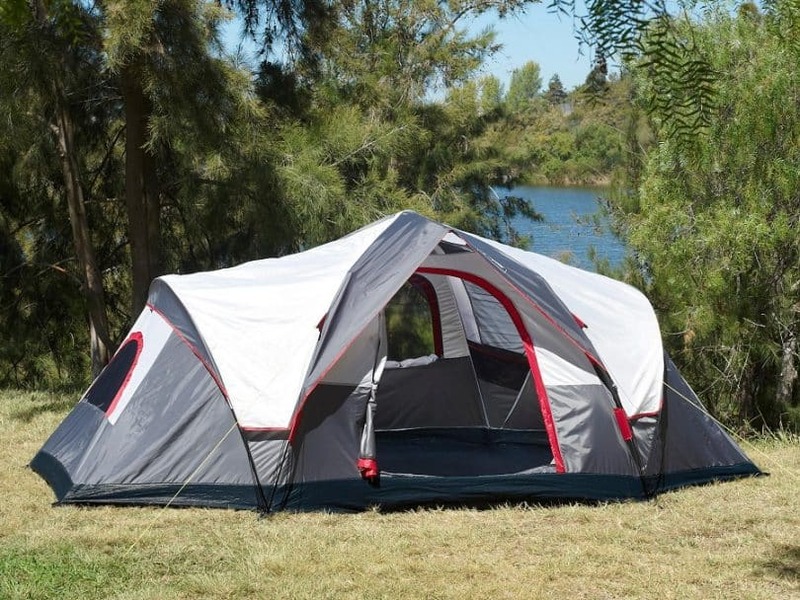 Most tents rated for six persons feature square or near-square rectangular base. It is because most are rated to accommodate a single row of six sleepers in bags and their necessities aside. However, the internal organization may be somewhat different and often depends on gross volume and tent height. The market of six person tents has more cabin form factor options than it is found on four person tent market. That’s because it requires more space for occupants’ luggage. Also, vestibules, whenever they are included, are much larger. Some of these tents can have entry awnings and a plenty of pockets. Another possible reason why cabin designs are more popular is the form of the fly commonly associated with it. While on dome tents a fly usually covers the entire tent, on the cabin tents it is basically just a cap, often integrated with the frame. It makes the whole tent more breathable, and since cabin tents have usually larger floor areas, it makes up for the lack of vestibules provided by rain flies found in dome-shaped tents. Finally, the construction of a cabin tent is much more stable, and since it is a larger tent, it must be designed to sustain more wind hit. The number of persons in backpacking tents pertains to the maximum number of persons who can lie down on the floor in their sleeping bags. However, a smaller number of occupants will allow for inflatable air beds and other comfortable pieces of simple furniture and cushion. 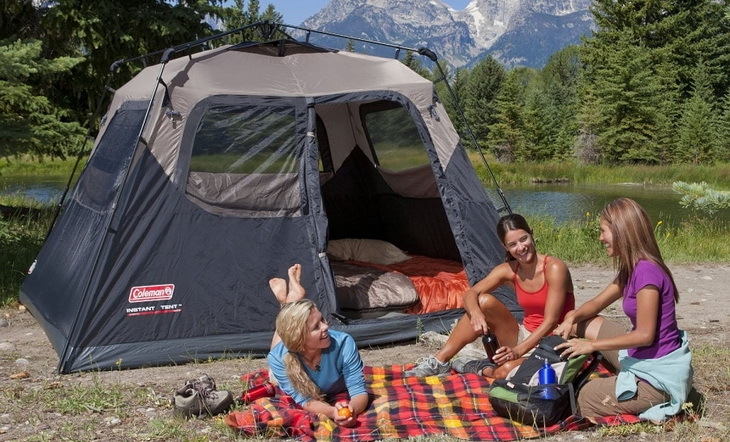 Some families or groups of four will simply find four-person tents too tight. So a six-person option might be a better solution for them. It would allow more room for both the occupants and their luggage. This may play a key role in making the right choice for you. It is needed to take care of the weight, its form and the number of doors. If you need to use a six-person shelter at its full capacity, it means six persons who will sleep close to each other and it is enough to quickly heat up the space. While it may be good in rainy spring or fall days, during warm winter nights it can really be a nightmare. Since an air-conditioned backpacking tent is yet to be invented, most manufacturers offer such tents with large mesh windows and vents, while the fly is usually breathable or just tops up the tent like a cap, allowing more airflow through the windows. To know your best choice, you should take a look in these eight tents below. All of these are distinctive and appeal to different kinds of outdoor enthusiasts, depending on the group size and composition, activity type, duration, lodging environment and weather conditions. Material: 75 den nylon + 40 den mesh walls, 150 den polyester flooring, 75 den fly. Aluminum poles. Specific features: Tall dome, 6.2 in. large vestibule, additional small vestibule (both water resistant), two doors with half windows, 3-season freestanding form factor tent. Best use: Backpacking, hiking, fishing. 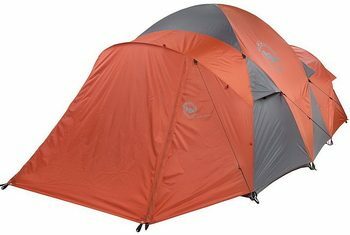 Description: One of the largest and very comfortable tents on the market, the REI Base Camp Tent becomes even roomier with the fly on. Built to last throughout many uses in various rugged environments, this shelter gives an outstandingly dry feeling inside. While there is no rain, the fly and mesh can be removed to unveil its very large windows allowing plenty of sunlight in. What we especially like are its seams and aluminum poles – clearly made with an idea to serve for years. Despite its robust construction it is really easy to set up, which makes it good for groups who relocate often. The structure is built to sustain some very strong winds. The tent also has a wide door that lets you have access to 2 doors so it is easier to get and out of the tent. The doors also have a fabric so you can have a little bit of privacy and there is a mesh fabric so the tent can vent well. The flooring is made of 150 denier polyester and is abrasion resistant and puncture resistant. Related: The E-TRENDS Portable is a two pack of lanterns that will give you light wherever you go. They are about $10 in price and can hang up in your tent. Material: 75 den nylon + 40 den mesh walls, 150 den polyester flooring, 68 den fly. DAC DA17 poles. Specific features: Dome tent, two large D-doors, two vestibules, vestibule area 28 sq ft, very tall 76 inch tent. Description: Despite its brittle look, the Marmot Limestone Tent is actually a rather sturdy construction. The look is thanks to the finest materials and plenty of mesh around the top making it one of the brightest illuminated tents on the market. When you cover it with the rain fly it rewards with two giant vestibules. 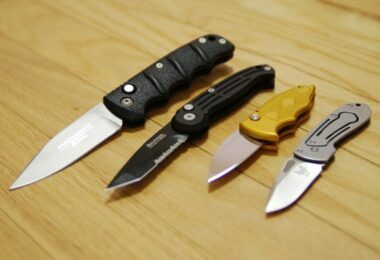 Each of these can keep a mountain bike and some other large things and bags besides that. Even very strong winds at 75 mph or even faster will not be a problem. This weather resistance is one of the main reasons for this tent: it will keep you and your stuff perfectly dry even in long and strong rainstorms. The tent comes with a free doormat – another feature you will like when your back country trip turns into a rainy and muddy adventure. Users like this tent because of the comfort, ability to keep them dry, and it has illumination to allow users to see. Not only that, but the vents worked really well! Related: The Trekology Ultralight Camping Pillow is a light pillow that will inflate so you can have a head rest while camping! Material: 150D/150D polyester canopy with taped seams, vented polyester fly. Specific features: Tall and roomy cabin tent with integrated fly, 1 door, 4 large mesh windows, 60 second instant setup, WeatherTec secure floor and seams. Best use: Backpacking, camping, hunting. Description: For lovers of real large cabins, and those ably to carry them, the Coleman Instant Cabin is perhaps one of the best options. Every Coleman tent undergoes rigorous, severe weather laboratory testing to make sure you always get the right thing. It takes only 60 seconds to erect from fully packed in the bag, including integrated and vented rain fly. You will feel like home thanks to its height and huge mesh windows over all four sides. Note that the rain fly comes as an option; it is though rather minimalistic and does not add much to the weight and package volume. Besides the fly, another nice optional feature is the setup and maintenance kit. 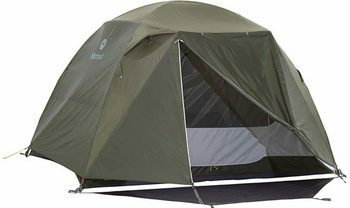 Users like this 6 person tent because of the affordable price, and the high quality materials that are used with this tent. The center height is about 6 feet tall, leaving room for you to stand up fully. 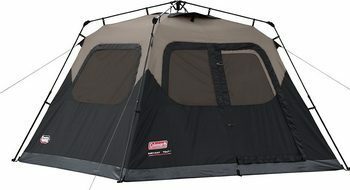 Related: The Coleman Instant Rain Fly is about $30 and will allow better air flow into the tent! Material: Special weatherproof materials intended to sustain extreme weather. Specific features: Extra large cabin, CORE H20 Block Technology and adjustable ground vent, gear loft with lantern hook, pockets, electric cord rack, tent stakes, rain fly. Best use: Backpacking, hunting, long term camping. Description: CORE Equipment is known for making extra large outdoor shelters so the Core Instant Cabin Tent might be the smallest model they offer. Despite being one of the largest 6-person tents regarding the floor area and volume it still comes with an easy setup mechanism allowing you to erect it in less than 60 seconds. The tent has zippered covers on all mesh doors and windows, so you do not have to cover the entire tent with the fly if the weather is still fine and you need some privacy. The canopy is also weatherproof, so for some mild rain and wet weather conditions you may not even need the fly, though it will be much more useful for heat and sunlight protection. The tent has wall organizers and can accommodate two queen air beds. 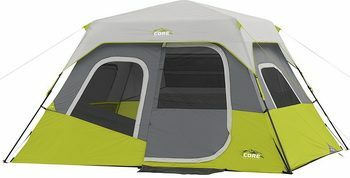 Overall, users like this tent because it is roomy enough for everyone and it protections you from wet weather conditions. Related: The CORE 85 Battery Lantern has lifetime LED bulbs and impact resistant construction. Material: 100% Hydra-Shield cotton duck canvas. 16-ounce polyester floor, Steel poles. Specific features: 4-season cabin tent, 24 sq ft awning, 2 doors, 4 windows, very steep walls. 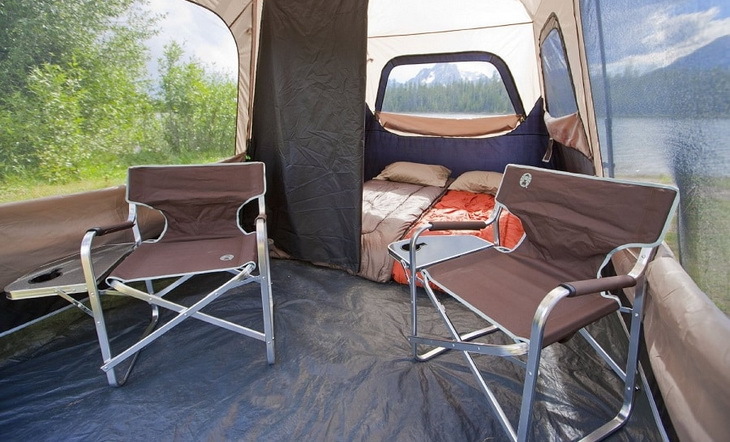 Description: The Kodiak Canvas is a cabin tent which maximizes the room volume. Thanks to its distinctive steep walls and boxy look, along with one of the largest floor areas among 6 person tents, it stands extraordinary 6’6’’ tall making it one of the tallest shelters for long backcountry stays. This is also one of the heaviest shelters which will add almost 70 lbs to your luggage. But when you are tired carrying, after a quick setup, you will be rewarded with its feel-like-home sleep. Bring in some queen air beds if you do not need it to sleep much people. It is one of the best thermal insulation tents thanks to its cotton canvas. But it is also highly water resistant and is one of the most rugged shelters, too. If you don’t mind its really large weight, look no further than this one. 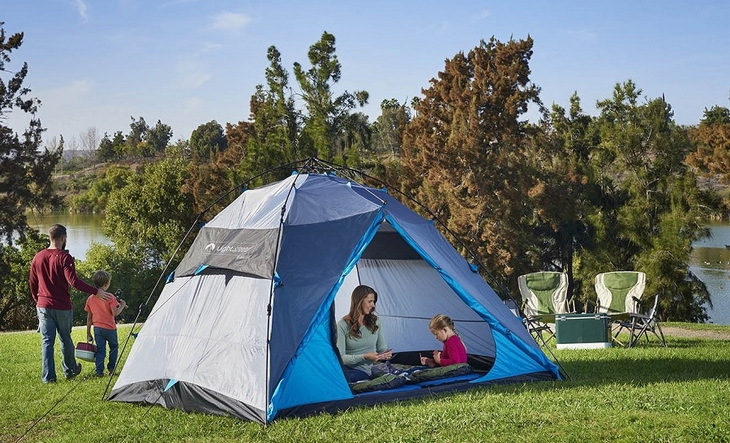 Overall, this tent is well loved by users! Related: The Dry Top Heavy Tarp Item is under $20 and is heavy duty and laminated on both sides. Plus it is UV treated! Material: Polyester walls and fly, steel + fiberglass frame. Specific features: 3-season cabin tent, easy setup feature, integrated rain fly, 1 door, 4 windows, 7’ central height, racks and organizers inside. 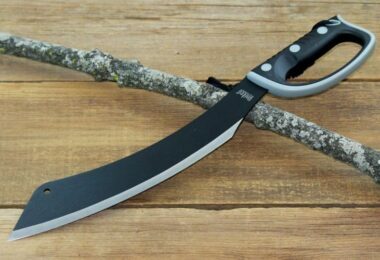 Best use: Hunting, fishing, longer stays in the wild. Description: Perhaps the tallest, the Eureka Copper Cabin gives a rather good weight-volume ratio. Despite being one of the bulkiest tents, it is not particularly heavy, even though its poles are made of steel. The door is very large and allows two persons to pass by at the same time. All four windows feature Quick-Stash flap for the very convenient opening and closing of the window when thermal regulation and privacy is needed. This shelter has a rack for power cord, gear loft, carry bags and stakes and a fire retardant. Fly guy points provide with additional security in high winds. 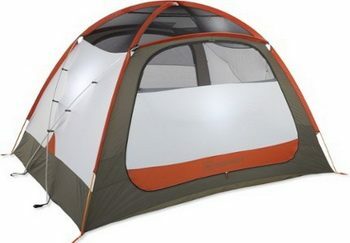 Users like this tent because the price will not break the band, and it has a lot of space to sleep 6 people. The door is large for easy entering and exiting, and there are a few windows for ventilation, and it is free standing and easy to set up. Related: The Coleman Tent Kit is under $10 and comes with several items you could use in your tent, like a dust pan and small broom! Material: Rip stop breathable polyester walls, rip stop polyester fly with polyurethane coating, aluminum poles. 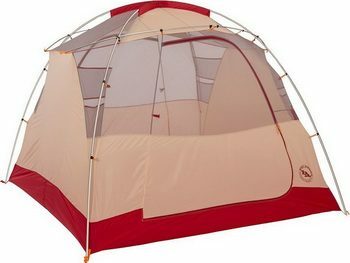 Specific features: Four season, two-room tunnel tent, large vestibule area 26.5 sq ft, 2 zipper-locked door-one for each room. Many windows, Reflective guy line for increased visibility. Best use: Hiking, backpacking, fishing, mountain biking. Description: If you are a family with smaller children, the Big Agnes Diamond Tent will be the perfect fit for your needs. You will be able to keep your children in their separate room. Despite its complex look, this shelter is remarkably easy to set up and tear down. This tent is made to be durable and resistant, but it is not a rugged tent, it is not recommended for very fast winds. However, in heat you will have a considerable sunlight protection. There is a total of 10 mesh storage pockets which will cater for most your necessities. Made of nylon, this tent is free standing and has double doors for easy entering and exiting. The rain fly is made with polyurethane and is waterproof, as well as the flooring of the tent. 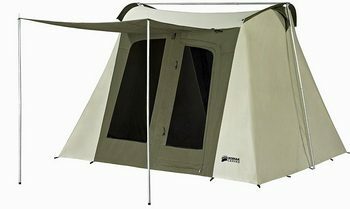 Made for 3 seasons, this tent has 15 hook stakes with it and the door has vertical zippers for easy use. Related: The Flying Diamond Tent Footprint by big agnes is made for a 6 person tent and cost about $75. Material: Polyester with 1500mm polyurethane coating on the floor and the fly. Polyester walls, aluminum poles. Specific features: Two doors, two vestibules, large mesh wall areas, LED light tracks (require an external source of power), waterproof taped seams, QuickStash door access. Best use: Hiking, mountain biking. Description: The form factor of the Big Agnes Chimney Tent is neither dome nor cabin – it is somewhere halfway between the two. It does combine the comfort of a cabin with the convenience of dome tents. 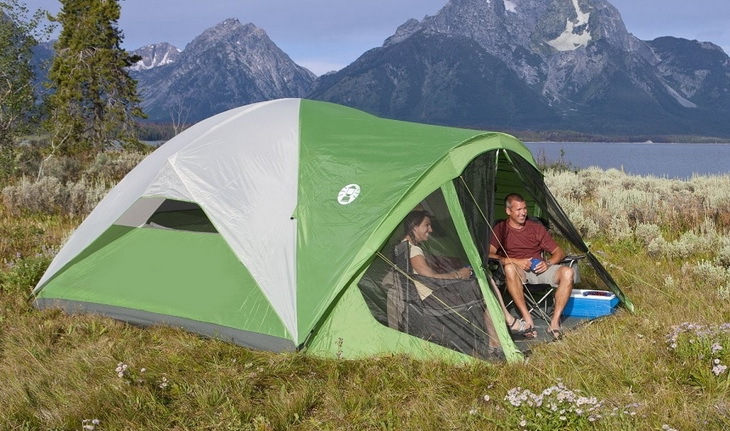 It is also one of the lightest 6-person tents by weight. To power the LED lights you can use three AAA batteries or any USB source – power bank, smart device, laptop or solar charger. 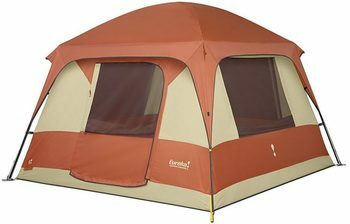 This tent comes in a Orange and Cream color, weighs about a pound, and will fit 6 people comfortably. The patented illumination of MTNGLO allows LEDs to light up your tent without adding heat from lights or having to hang up a lantern to see! The best part of this tent is the 2 doors that make the tent into two vestibules. This allows for more privacy, if needed. Users say that this tent is highly comfortable, allows them privacy and has a lot of space to move about! Related: The Tentlab Deuce Potty Trowel, comes in many colors and costs under $20, and is great for your camping needs! Generally speaking, in most cases a six person tent is a better option than a four one, even if your group or family has no more than four members. They often give much more space for much less difference in price and weight when compared to four person tents. Six person shelters are also not much more complex for setting up and tearing down, and thanks to the great care in choosing materials, these are at least as durable as four person tents. New, great tents keep appearing every day, and even if none of these eight items are not satisfactory for you, you should take a look at some more options. Whenever you find a suitable tent that is not on our list, feel free to share it with our community along with the key reasons why you chose that exact model over many others in the market. Which tent do you like the best? Do you have a 6 person tent? Tell us your thoughts and more in the comments below!